As we know, the Snakes and Ladders is a game that contains numbered plates with numbered squares, snakes and ladders, as well as two small plastic pieces with different colors in order to distinguish each player; besides, there is a cube with numbers from 1 to 6 in its sides, a player throws this cube and according to the number that she gets she passes the same number of squares. If she accidentally stops in a square that contains a ladder, then she goes ahead through it until she gets to its end and leaves the plastic piece there. But if she accidentally gets into a square that contains a snake, then it takes her down again, passing the snake picture until its end. The game ends when one of the two players goes through all the squares. Maybe I gave to many details on this game, but I had to, since in my opinion this is the favorite game of Israel and Palestine, and the longest one as well. 65 years have passed already and there is yet no end to this game, it has to be some sort of record! In the 65 years of the Israeli−Palestinian conflict, it has witnessed many attempts at negotiating peace, but as soon as it gets to the critical point of reaching an agreement, the snake bites the peace process and it goes down again to the point where it started. Then it gets into a ladder, the peace process goes fast towards reaching its goal and suddenly that snake appears again! 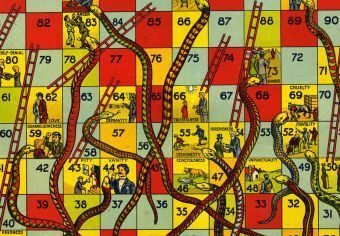 This has happened for more than 65 years…Snakes and Ladders. I myself, a Palestinian of only 21-years old, feel already bored with this game and so many others too, I can’t understand why there is no end for it. Why aren’t there any honest answers for this question? Either we WANT Peace or NOT! Why the two governments still play this game? I think 65 years playing the same game is totally not amusing, especially when there are civilians here that suffer from this game, civilians that want to live in peace with each other. Until when will you keep playing and labelling us as “occupied” and “occupier”? Until when will this conflict last over something that is, in the end, God’s property? I wish that this pointless game will end soon, that we will no longer be called as “occupied and occupier”. I wish that the killings and the imprisonments would stop, it goes against all religions. I hope that the next negotiations between the two leaders, Abu Mazen and Netanyahu, will finally find their way towards peace. I hope they will replace the snakes for ladders, and finally get rid of all those real snakes that aim to put an impasse on the process and delay our peace. Finally, I would only like to pray for peace and love upon all of us! Posted on July 28, 2013 April 10, 2016 by rebeccabrindzaPosted in English, UncategorizedTagged AhmedJenin, IsraelPalestine, palestine, peace, yalayoungleaders.